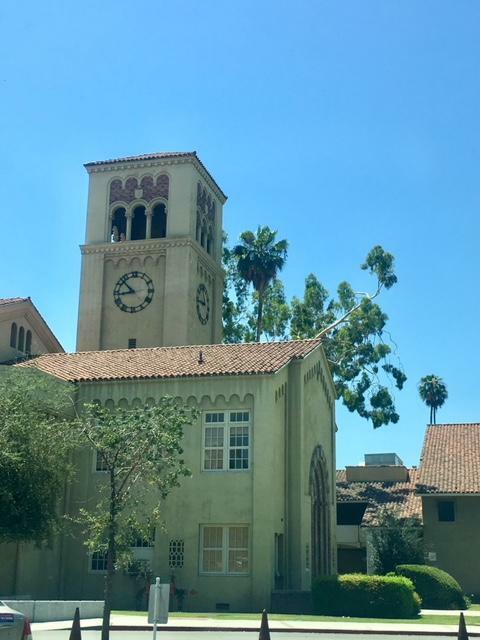 Welcome to the South Pasadena Middle School (SPMS) PTA Website. 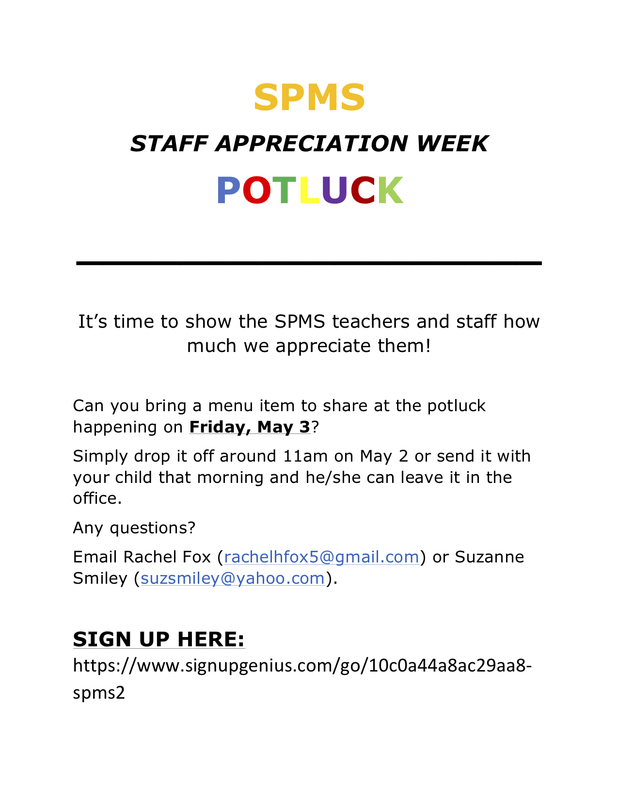 The SPMS PTA is a partnership between our dedicated parents, teachers, administration, and staff. We all work together to enrich our children’s education and school experiences, and to unite our community. We do this inclusively, by having conversations, developing programs, activities, raising funds to implement these plans. Your involvement, no matter how big or small, is not only welcome, but also necessary for our students to thrive! Principal Chat! Want to talk to Principal Kubela in an informal setting? See you Friday, April 26th, 8:15 a.m. in the Cafeteria. 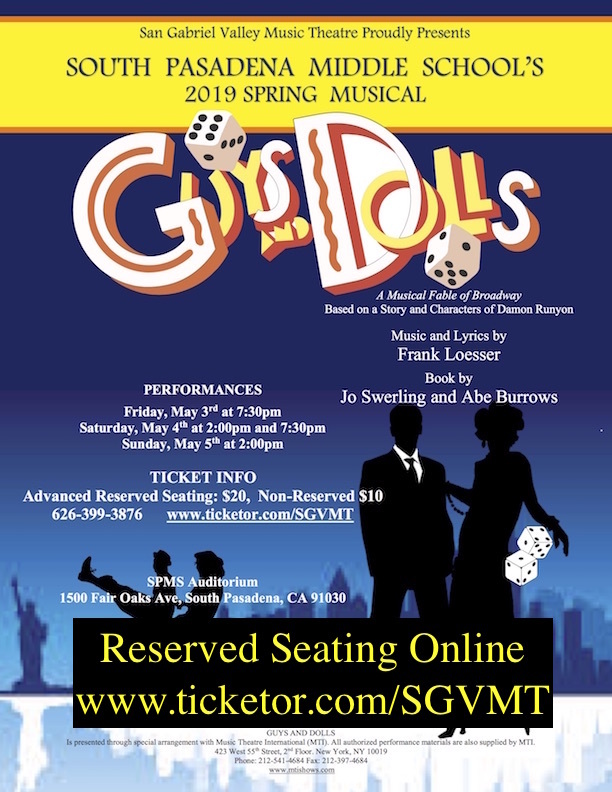 Our students are responsible for this year’s presentation of GUYS & DOLLS’ acting, costumes, set design, film, and makeup! Support them and join us for show time! Saturday, May 4, 2:00 p.m. and 7:30 p.m.
Sunday May 5, 2:00 p.m. MENTAL HEALTH WEEK — May 6-10. As SPUSD supports wellness thoughout the district for the entire month of May, we’re offering something new at SPMS. Students will get a week of lunch breaks to explore and learn stress-relieving skills such as meditation, yoga, art therapy; take mental health IQ quizzes, express their moods on Post-its; and enjoy (supervised) time in a quiet room. Activities will take place with the help of certified mindfulness coaches, SPMS Counselors, staff, parents, PTA, ASB and Upstanders. PTA Picnic & SPMS Open House — May 22, 2019; details TBA, but for sure the Kona Ice Truck will be there! Wednesday, May 29, 7 – 8:00 p.m., in the SPMS Library. The 2019-202 Executive Board (below) will be sworn in. Thank you for shopping on Amazon for goods and gifts using the SPMS PTA/Amazon link. A heart-felt thank you to those who served in the 2018-19 Executive Board and will be stepping off. You are deeply appreciated. You will be missed! Follow us on Facebook and Instagram, and check here regularly for changes or updates. Questions or suggestions? Please contact PTA President Emily Cline at emilycline@sbcglobal.net. We look forward to seeing you at the PTA meeting and events!